Getting ready for the ride of her life, Tidewater Community College Horticulture Assistant Professor Kristina Bezanson will make a 585-mile, week-long journey on her bicycle to fund tree education and research. 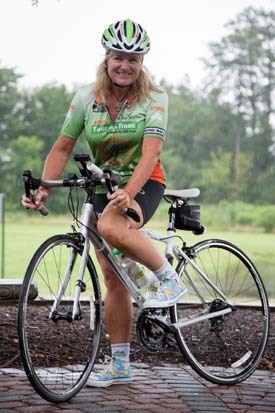 A registered rider for the STIHL Tour des Trees, Bezanson will ride through the Oregon Trail, beginning in Portland, Ore., on August 5. The trek will take her through Oregon’s coastline, vineyards, high desert and the Columbia River Gorge, with Douglas firs and Mount Hood providing the backdrop for a visually spectacular week. An ISA Certified Arborist, Bezanson’s favorite class is HRT 259 Arboriculture. “I’m nuts about trees,” she adds. Bezanson shares her time with tree-related groups and serves as the vice president of the Virginia Urban Forest Council. Though Bezanson started her career as a professional photographer shooting landscapes, she quickly determined that she’d rather be in the landscapes than the dark room. She retrained, and has worked in the horticulture industry for more than 20 years. She joined TCC as a faculty member in 2009. “During the tour, I’m looking forward to cycling through spruce and fir forests, and dipping my tired toes in the Pacific Ocean,” Bezanson says “And, of course, sampling the local culture. To learn more about Bezanson’s ride visit stihltourdestrees.org.